It’s hard to believe that over a month ago we celebrated my baby turning 3! It was over 3 years ago that we brought all 6lbs of baby Kinsley home with us and we have been loving her ever since. She is such a joy and a delight to watch as she sings and dances her way around our home. Kinsley loves telling stories, making up songs, twirling with her ballet shoes and lining up her toy horses. She is battling a runny nose right now and this evening she snuggled with me and said, “Mommy, I want my nose to stop hurting!”. Talk about breaking a momma’s heart. I just held her and cuddled with her and soaked in the moment of her needing me. Every milestone, every birthday, every runny nose; so many moments I am reminded of how blessed I am to have Kinsley in our family. So today, we wanted to give you a little behind the scenes sneak peak into her special day. 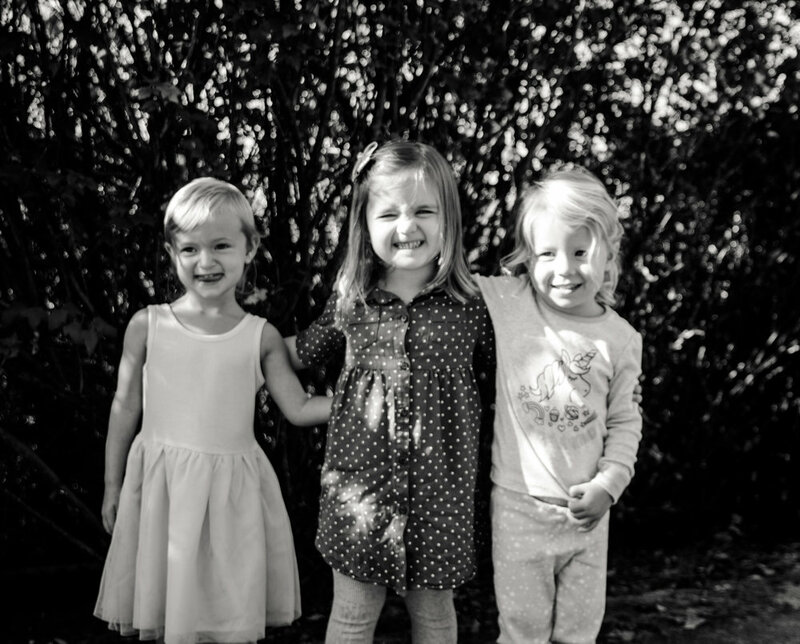 A month ago, Kinsley invited three friends over and her cousins for a play date of fun, colouring and cookies! Kinsley’s favourite things are her family, her friends, the ducks, horses, making art and cookies. 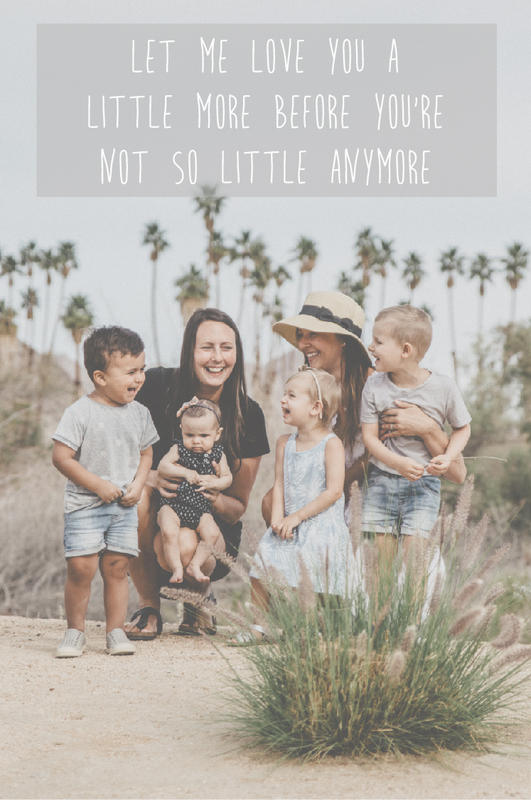 Naturally, I combined them all to make a fun, easy playdate for the little people she loves. Here are a few highlights from her special day! I don’t know where her love for horses came from, but this girl always has her eyes peered for horses whenever we drive in the country. This horses sticker book from DK books allows kids to make pictures, do matching activities and create scenes. It was the perfect take home treat for her friends! Obviously, no birthday outfit would be complete without a little accessory. Kinsley chose this pink heart bracelet form Great Pretenders and it worked perfectly with our colour theme! We all took a few minutes and created farm scenes with stickers, cutouts, as well as Chunkies, Big Brush Markers and Sparkle Gel Crayons from OOLY. 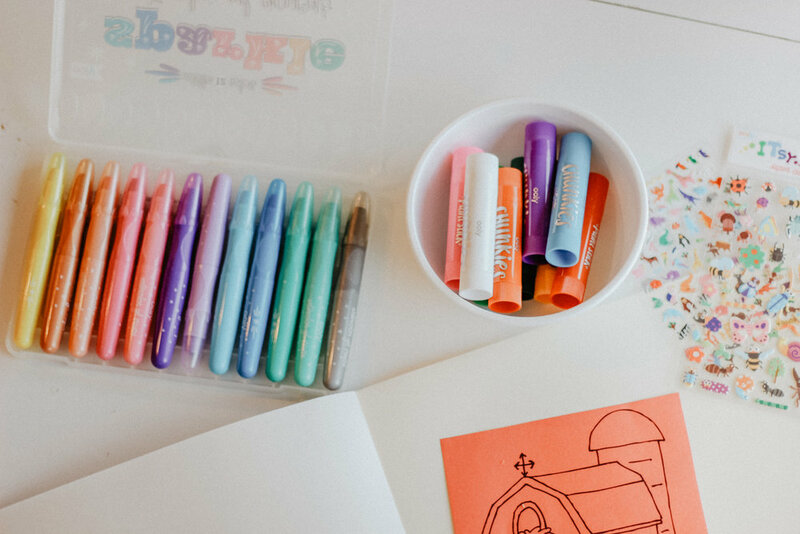 OOLY is our favourite art company for children and Lauren and I both love so many of their products. They are colourful, vibrant and easy to clean up. The Chunkies are probably our favourite because they are paint sticks, without the messiness of paint! If you are in the US you can order directly from their website, and in Canada Indigo and Amazon both carry their products! Kinsley loves taking silly photos. We took our Instax camera from Fujifilm Canada and snapped a photo of Kinsley and each of her friends to take home. This was a special treasure and we had so many different fun backgrounds to choose from! The Pink Lemonade background - just adorable! As her friends crafted, we all snacked with our Stackers from RePlay filled with popcorn. The fun part about RePlay snack stackers is you can order any colour to fit your party theme. The pink and white went perfectly and afterwards, they are great for taking snacks to school, the park or travelling. Kinsley loved sharing a beautiful pink bracelet with all of the little girls from Great Pretenders. This Canadian company (which you can find at Indigo Chapters) makes beautiful dramatic play costumes, jewelry and hair accessories for little girls and even teether toys for babies. We love finding awesome Canadian companies to support. The party decor was simple. 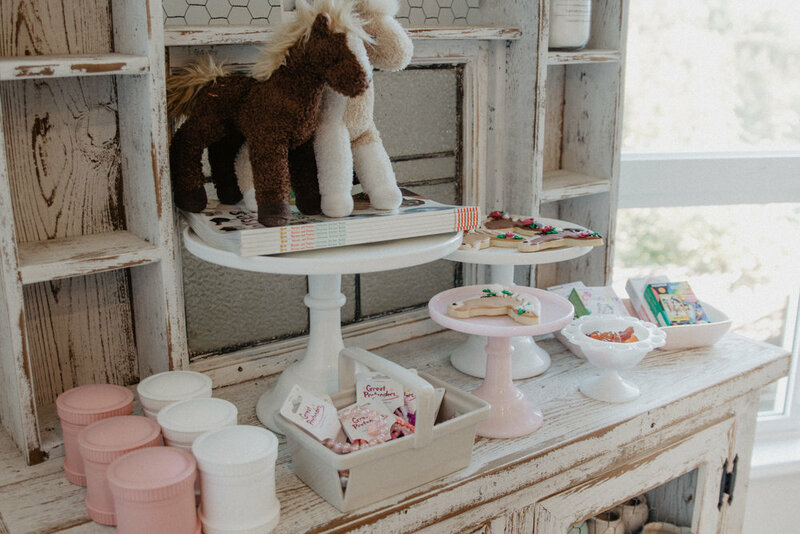 We used many items from Talking Tables We love their Pastels line and a few mini Unicorn pinatas. The light pastel coloured themed went perfectly with all of Kinsley’s horses and we made some mini DIY party hats so the horses could join the party! I love coming up with a theme and planning decor for my kids parties, however I am not the best cake or cookie decorator. So, I hired my cousin, Katrina, to bring my vision for Kinsley’s party cookies to life - and WOW - did she ever!! They were stunning and almost, ALMOST, too pretty to eat (SO DELICIOUS!). Kind Bars are a staple in our home, and their new kids line is amazing. Kinsley’s friends loved the Chewy Honey Oat and the Chewy Peanut Butter Chocolate Chip, but we didn't forget about the mamas. While all of the children were playing, creating and eating, the moms were snacking on Kind Protein Bars (Double Dark Chocolate Nut is amazing). 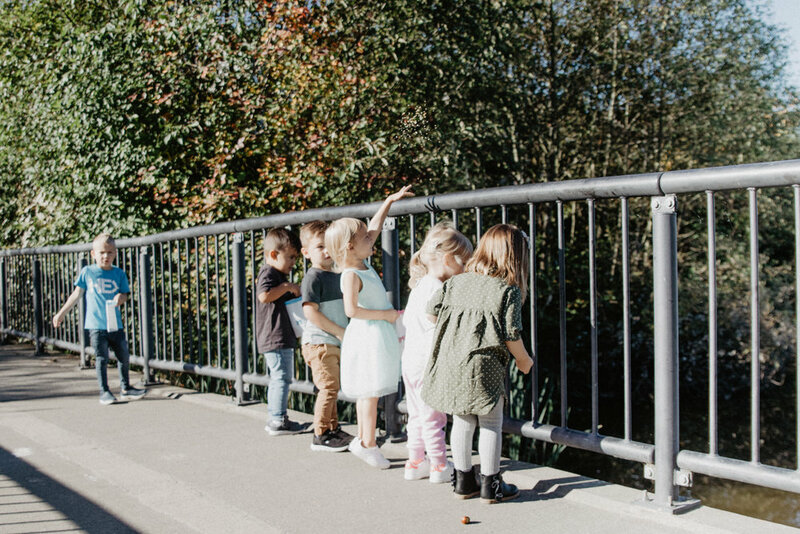 We ended the party with a trip to the duck pond and captured some special moments with Kinsley and her friends. When I look back at these photos I am encouraged and reminded how blessed Kinsley is not only to have a family that loves her, but an amazing group of moms, children and families that are always praying for her, loving on her and speaking words of life and encouragement to her. Behind each little face in all of these photos, represents a whole army of families who have become part of our village. We are extremely grateful to call them all friends as they shared with us countless words of encouragement, wisdom and laughs! What an amazing day to celebrate our youngest and the amazing years ahead of her!